SICILY. Syracuse. Second Democracy. Ca. 466-406 BC. AR tetradrachm (26mm, 16.27 gm, 7h). NGC XF 4/5 - 2/5, light smoothing.Struck 450-440 BC. Charioteer driving slow quadriga pacing right, Nike flying to crown the horses, ketos (sea serpent) right in exergue / ΣYRΑΚΟ-[ΣΙΟΝ], head of Arethusa right, wearing a ring and crescent earring, and a pearl necklace, hair bound with a cord which forms rounded mass of hair at nape of neck and a row of curls along the forehead. Boehringer 540 (V275/R378). Gulbenkian 264. SNG ANS 174. Rare transitional head type. Chalkis, Euboia. AR Drachm (16 mm, 3.45 g), c. 338-308 BC. Chalkis, Euboia. 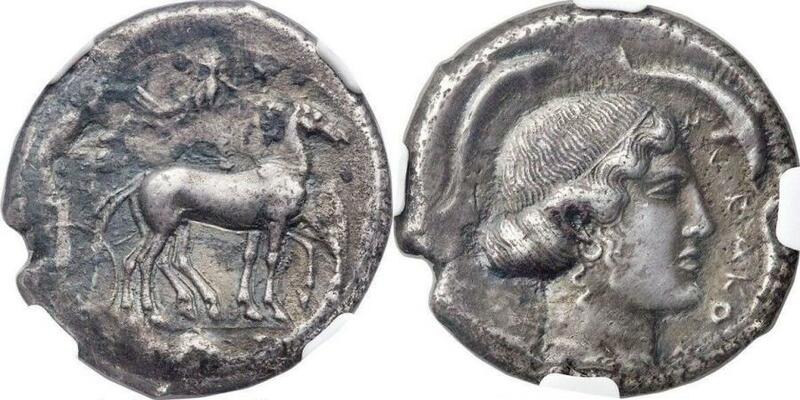 AR Drachm (15 mm, 3.50 g), c. 338-308 BC.